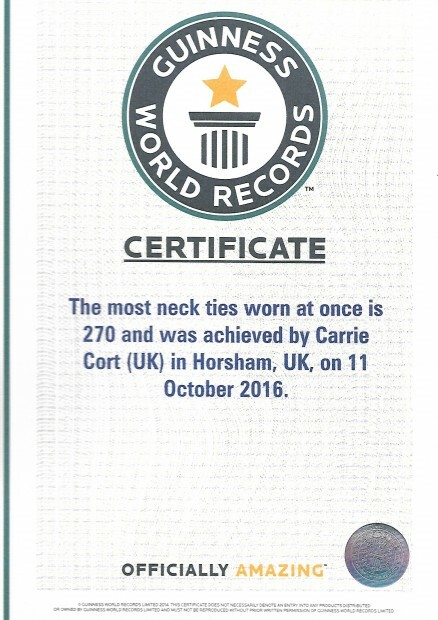 Carrie Cort is ‘Officially Amazing’, so say the Guinness World Record (GWR) office. Last year as part of a ‘Green Play and Display Day’ which Carrie organised in the Human Nature Garden, Horsham Park, she attempted to beat the GWR challenge for the person wearing the most neckties, which was 260 ties, 400 had been donated. Carrie managed to beat the record by 10, a small margin but her neck would take no more! Her GWR officials were (left to right) Jeremy Quin MP, Amanda Jupp – WSCC County Councillor, Paul Bellringer – founder of Horsham Festival and Sarah Bamsey, who placed the ties. 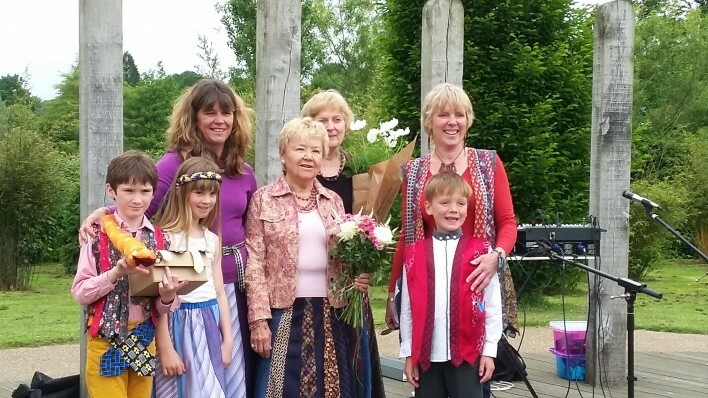 This attempt took place in June as part of an environmental awareness day she organised with the Horsham Circles of Life Festival. Families with primary school aged children and their younger siblings were invited to bring a picnic to this free ‘Green Play and Display Day’. The event included: lot of fun games learning about the 3 Rs – Reduce, Reuse and Recycle, children ran the recycling race, a mini fashion show mainly parading clothes made out of unwanted neckties and upcycled accessories and bags, followed by the Guinness World Record attempt. The Guinness World Record was a fun way to highlight the need to creatively reuse neckties. Carrie explains “Neckties tend to be an environmental nightmare, novelty ties get bought for people who might use them once or twice, charity shops don’t really want them as they are not particularly saleable and if sent for recycling they often get caught up in the machinery and cause expensive damage. Upcycling or reuse is preferable”. The West Sussex County Council Waste Prevention Team was on hand to talk to the public and Ron played his guitar and sang lots of ‘rubbish songs’. The event ended with a thought provoking ceremony will be led by Lyn Baylis, to honour our planet Earth and all its rich gifts. Carrie says “I invited the children to bring any unwanted DVDs or books to our swap shop – bring one and take one, there was a textile recycling point where people were able to contribute unwanted textiles which were recycled through the local charity Bags of Support”. You can watch a video of the GWR attempt here. Remake, redesign and repair creative craft textile workshop. Eco Beast Sculpture Competition for schools, nurseries and children’s groups in West Sussex. We will be attending a number of public events with our green stand and school events with interactive educational stand, take a look and see where we are going here. Talks and presentations to adults. Green assemblies, lessons and days in schools. 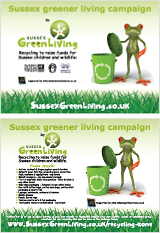 Diverting waste resources from landfill into our Sussex Greener Living campaign. Working with Transition Horsham – Climate Change and Energy group. Helping to organise and mobilise the UK Climate Reality Leaders as a group. If you have any queries or would like us to deliver a talk or presentation and bring our green stand to your event contact us here.